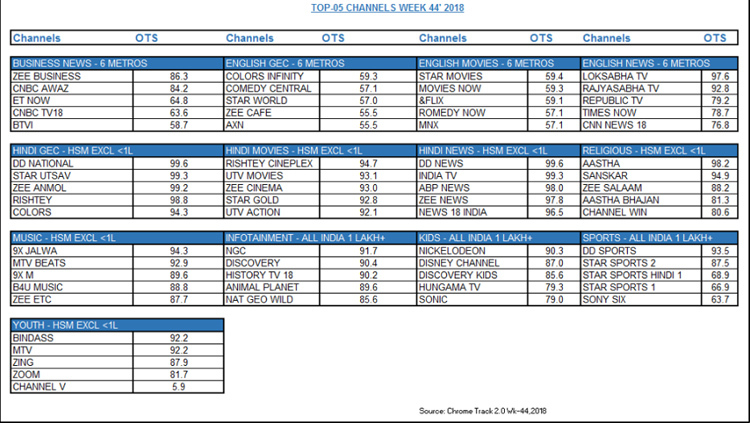 MUMBAI: With a growth of 0.99 per cent, the business news genre in six metros, marked the highest opportunity to see (OTS) among all categories in week 44 of Chrome Data Analytics and Media. In the business news genre, Zee Business gained the highest OTS with 86.3 per cent growth in six metros, followed by sports genre garnering second position in All India 1 Lakh+ market with 0.91 per cent growth. DD Sports garnered the highest OTS in the sports genre with 93.5 per cent. The third position in the gainer’s list of OTS was grabbed by English news in six metros with 0.69 per cent. Loksabha TV raked in the highest OTS in the English news genre with 97.6 per cent. English GECs stood at fourth position in six metros with 0.36 per cent by Colors Infinity gaining the highest OTS with 59.3 per cent. In the fifth position, religious genre secured 0.30 per cent growth in the HSM excluding less than one lakh market. Aastha channel garnered the highest OTS with 98.2 per cent.